German potato salad is traditionally served hot — perfect for the fall potluck. It usually has a hot vinegar dressing flavored with herbs and spices — like this classic recipe served at a potluck luncheon at our house recently. Time tested and stamped approved!!! Start with boiled potatoes. The peel will slip off the boiled potatoes easily. You can rub off the peel by using a clean dish towel. Hold the potato with the towel in one hand and rub off the peeling with the other — somewhat similar to drying a cup. Or hold the potato on a cutting board with a fork and gently tease off the peel with the tip of a knife. Stir the cooked potatoes into the dressing gently to avoid breaking them. I would also tip the skillet to make the dressing run to one side and spoon it over the potatoes to lessen the amount of stirring necessary to coat the potatoes. Less stirring = nicer looking dish. Donna was a guest at one of the two luncheons that took place on our deck last week. They were casual affairs of the potluck sort with the guests bringing a salad or dessert. Donna brought this classic hot German potato salad and was gracious enough to share the recipe she’d gotten from her sister in law — the very best kind of recipe. Donna said she’d used her mother’s recipe without the spices, until she tasted this combination of flavors. Finding out the recipe was easy to make was a bonus! This week is Donna’s birthday. Here are wishes for a wonderful celebration day and the beginning of a fabulous new decade!!! Donna also shared this recipe for Spinach Salad with Lemon Garlic Dressing at a similar event a couple of years ago. And Cheese Broccoli Soup. Both also a classic and wonderfully delicious! A tangy, yet slightly sweet potato dish with bacon and onions! Delicious with brats or burgers, a hit at potlucks and just for the family at home. Cover potatoes with water and boil potatoes until tender about 15-20 minutes. Drain and somewhat cool to touch. Peel and slice into ¼ inch slices. While boiling potatoes, cook bacon till crisp in medium sized skillet. Remove bacon and reserve 2 Tablespoons of bacon grease in skillet. Add onion to drippings, cook on medium heat till tender. Set aside until potatoes are peeled and sliced. Stir in flour sugar, salt celery seeds, dry mustard, and pepper until mixed well. Stir in water and vinegar. Cook over medium heat, stirring until thickened and bubbly. Gently stir in potatoes & bacon crumbles. Cook, stirring gently 1 or 2 min till heated through. 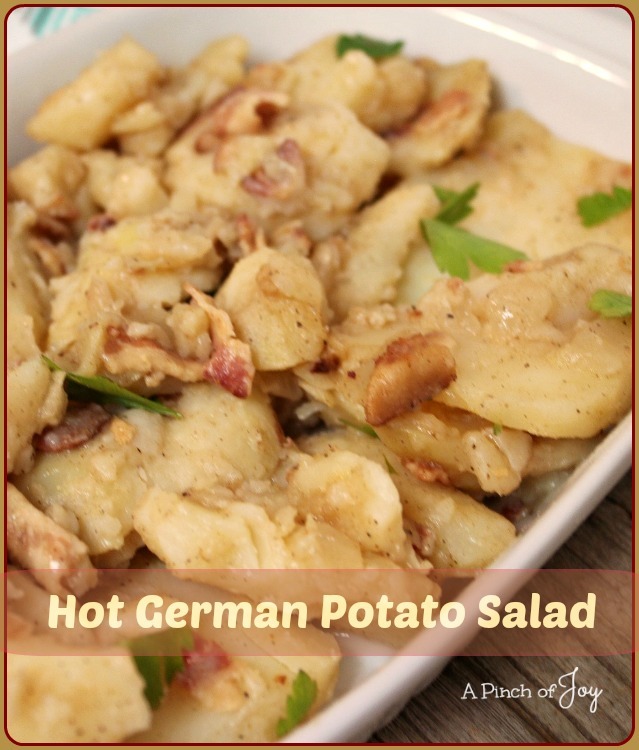 Love hot German potato salad, and yet I have never made it. This one is going in the recipe file and onto my PInterest Recipe board!